Follow these steps to proceed quickly through the eNegotiation Exhibition process. Check your email and click on the activation link and login. Follow the Smartsettle One Negotiation steps. You are invited to become a full participant by making a minimum $20 donation.Full participants are able to proceed with Smartsettle Infinity training and they are also eligiblefor recognition upon completion of the exhibition. Members of sponsoring organizations areautomatically considered full participants. Please sign in first if you wish your donation to be credited to your account. You will be using the latest beta releases of Smartsettle One orSmartsettle Infinity according to your choice when you registered.Note that these systems will be on a server with limitations.You may need to exercise some patience if the system reaches capacity. Participation is open to anyone, anywhere in the world. Individuals(or their close relatives) employed by Smartsettle or directlyassociated with Smartsettle or anyone else having intimate knowledgeof the cases will not be allowed to compete for standings or prizes.Many of the participants are university students (e.g., ConflictManagement, Industrial/Labour Relations, Business, Law, etc. )whose training is supervised by their instructors. Qualified evaluatorswill be chosen by the organizers. Each participant is encouraged tonegotiate individually in their own case. Your objective is come to a good agreement specified in terms ofpredefined possible outcomes. In the case of quantitative issues,players may agree to any outcome within the specified negotiatingranges. In the case of qualitative issues (only in Infinity),players must agree to one of the pre-defined options.Smartsettle Infinity participants may start at the time of theirchoosing (subject to availability of a suitable opponent).Smartsettle One competitions are held continually throughout the year.If you are not satisfied with your performance, you may attempt toimprove it in a subsequent competition. You may not reveal your true identity (or affiliation) to your opponent.To facilitate this, each individual (or group of individuals playingtogether) must choose a pseudonym and use only that name whencommunicating with their opponent. Anyone revealing his or her trueidentity may be disqualified from the competition. Anyone that feelsthat their identity has been compromised through no fault of theirown may request that their negotiation be restarted with a new opponent.Identities of the top performers may be revealed in the Top Standings. Coaches are encouraged to provide assistance to their students so thatthey perform as well as possible. Online training materials areavailable to use as module material. These materials will give studentsan orientation to the theory of eNegotiation systems and teach themstrategies of negotiating that emphasize the objectives of fairnessand efficiency. Coaches should communicate with the exhibitionorganizers to make sure that their students have adequate trainingmaterials on time. It is desirable that coaches observe their studentsduring the negotiation, either in the physical room or by observingthe competition online. Coaches may be consulted if there are questionsduring the evaluation. A number of cases are available to choose from. In each case, you mustnegotiate according to pre-defined preferences. Communication with your opponent is restricted to online exchanges withinthe application. This is not meant to give the impression that eNegotiationsystems replace face-to-face meetings. It is only a matter of practicalityin the exhibition. In real-world negotiations, face-to-face meetingsthat emphasize relationship building and collaborative discussions arestrongly encouraged. If these are held in conjunction with online sessionsusing Smartsettle, then adversarial exchanges and the tedious negotiationdance become obsolete. We appreciate your cooperation in completing questionnaires. Thisinformation helps us improve the exhibition for future players. Links tothe questionnaires will be available upon login. We use a sophisticated formula to score performance. In general, thehighest achievers will be those who model their behavior after aprofessional in a real-world negotiation with the same preferences.If a player participates in a subsequent competition, thentheir new score will be based on both competitions. There are a wide variety of case types used in the exhibition. Cases usedfor Smartsettle One negotiations involve one numerical issue. Review theshared background information and any private information for the partythat you will be playing. The preferences are simple - one party prefershigh values and the other party prefers low values. Understand what you want and imagine what your opponent will do. Make anestimate of what you consider to be fair and what you would expect in thecase of no agreement. Real life negotiators resist conceding past fair butmight do so to avoid a worse outcome. So these two possible outcomesbracket the place where you will likely end up.Negotiating Range:Suggest a negotiating range to the otherparty by entering values for what you (optimistically) prefer and what theother party prefers (based on what they have said or what you know). If youare too conservative then the other party will extend the range.Initial moves:Make a generous secret move (with youryellow flag) rightout of the gate. There is no advantage in holding back because this ishidden from the other party. Make a visible proposal to show some movementwithin the established negotiating range and encourage the other partyto do the same.Concessions:Make your final secret move (with the yellowflag) early.This should be close to fair or reasonable in order to take advantageof Smartsettle's reward for generosity. Respond to the other party'svisible concessions with corresponding moves with your own green flag. If the other party is too unreasonable, an outcome can still be guaranteedif both parties agree to the END option provided in Final Session. Ifparties are very close then Smartsettle will settle the deal by simplysplitting the difference. Otherwise Smartsettle will use the opinion ofthree "expert neutrals" to determine "fair" and use the middle value tosettle the case, favoring the player who ends up closest to fair. Incompetitions, the costs of discovery are simulated by a penalty of 1% ofyour score in that case. In real lift, the work of discovery can be putoff until Final Session. If most cases solve before Final session thiswill result in significant savings. If there is a current competition, you must complete at least twonegotiations to be eligible for scoring. In order to score well, you mustreach agreement in more than half of your negotiations. Compete in as manycases as you like but be sure that you have time to finish them. Yourfinal score will be normalized between zero and 100 with a sophisticatedformula based on the inputs of all players. Remember that Smartsettlerewards those that exhibit collaborative behavior that values relationships. When you are finished your negotiations, we would appreciate yourfeedback in the post-negotiation questionnaire. Whenever we have a class or group from the same area, to enhance theirlearning experience, we make sure that they all play on the same side ifthe event is a competition. This makes it possible for learners to helpeach other out and for coaches to freely discuss the negotiation with themand to give them unbiased assistance. We encourage participants to competeindividually so that everyone has an opportunity to havehands-on experience. Many different cases are available to participants depending on interestsand skill level. All of them are canned so the negotiation will be mostlyconcerned about which decisions to make about pre-defined issues. Someaspects of the negotiations may be described qualitatively requiringinteractions between the negotiators to agree on what it means.There will be limited opportunity to change the basic structure of thecase set by the organizers. You are coming in at the stage where the SingleNegotiating Framework (complete with negotiating ranges for the issues)is already established. So there will be little or no negotiating about theactual wording of the agreement. Each player�s task is to agree withhis or her opponent on a package within the given negotiating ranges.Access to the confidential information describing your preferences willbe made available upon login. You must negotiate according to thoseprescribed preferences. This information will help you decide what isfair and what you would expect in the case of no agreement. Negotiators may communicate with their counterpart within Smartsettle.To do this, each player should enter into the Joint Session areaand post a message like this:I am ________ (User Name) representing _________ (your role).I am ready to negotiate.Be sure that email notification is turned on and that you have specifiedyour email address there. If you have a mobile phone that is compatiblewith Short Message Service (SMS), you may wish to use that addressfor notification. if their opponent also does well. I found the Smartsettle Infinity experience to be very exciting. As a newcomer, I felt challenged and amazed with the power of the program. The ODR technology in Smartsettle is awesome. I had much fun trying out Smartsettle One. Thanks to the promoter and the other players for that great experience. I'm looking forward to participate in the Smartsettle Infinity competition! I found that my choices were rather arbitrary and it was luck rather than skill that put me in the winners circle. I was more intrigued by the infinity program and in particular the maximizing the minimum gain feature. I enjoyed using Smartsettle in the negotiation competition. At our school we use conferences to resolve conflicts. I thought using Smartsettle was easy and fast. It was a pleasure participating in the Smartsettle competition at the 2008 International Forum on Online Dispute Resolution. I am presently setting up Clancy Adjusting and Mediating. I believe this technology has an enormous untapped potential in insurance applications. Participating in the eNegotiation tournament showed me the benefits of automated negotiation in terms of convenience, efficiency and satisfaction. I would use Smartsettle in a real negotiation if the need arose. It was a very interesting process. Ours was a bit abbreviated because of a compacted course scheduled. Using the software really made you think about the impact of one negotiation point on the others. Not having gone through the process before it was a little difficult with the waiting for a response, but it gave time to really consider all the options in making a proposal. The automated proposal generating was fascinating. Smartsettle is a unique, effective tool in the often complicated negotiation setting. The ability to manipulate and observe the effects on the various divisible interests involved in this negotiation allowed me to visualize where I could afford to "give and take." This eNegotiation tournament is a great experience for me to participate the online negotiation. I learned a lot from the entire negotiation process. Smartsettle is an effective tool to establish my negotiation plan and help me to go through the negotiation process. I value the opportunity to experience the potential for sophisticated negotiation tools, and to see what is possible for ODR in the future. A strength of the Smartsettle program was the ability to negotiate in contractual situations by assigning numerical satisfaction ratings to the proposals and packages. These ratings allowed the parties to have an understanding of their own interests and determine whether or not they had reached an acceptable agreement. The asynchronous nature of the system, along with the "changes waiting" prompt, was very convenient and responsive. With technology moving quickly and the need to settle disputes in a more efficient manner, eNegotiaion leads the way in ODR methods. 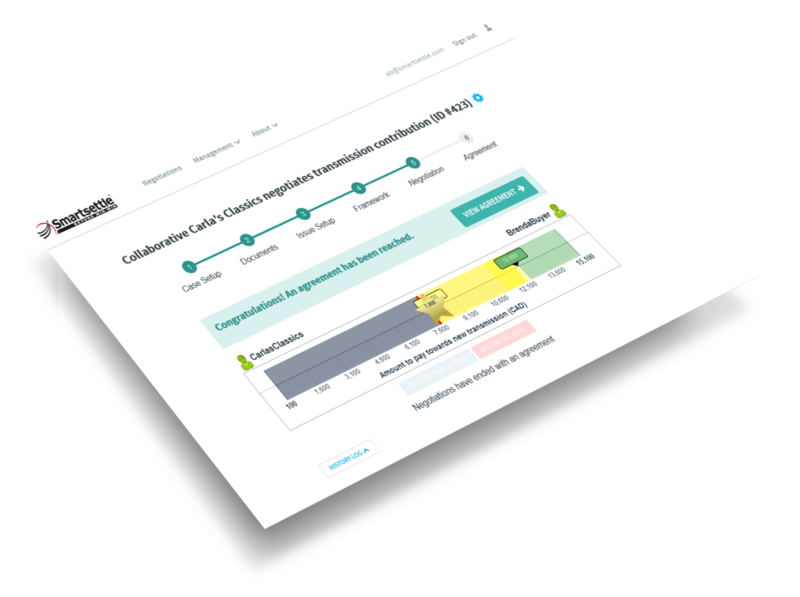 Smartsettle's eNegotiation uses practical and effective tools to help parties come to mutual decisions. This was a great learning experience as parties from all over the world participate in negotiations without ever meeting face to face. I would recommend that companies, businesses and private parties consider utilizing eNegotiation to settle disputes. Smartsettle is far beyond the competitors. There is no value left on the table at all with Smartsettle. This eNegotiation system is my favorite, it is systematic, graphic, rational based and has a good intuitive interface. The more issues there are, the more powerful it is. My favorite features are: Even Swaps, Suggestions, Tuning with Satisfaction Graphs, and the package deal. I enjoyed the competition. I am looking forward to using this system in multiparty negotiations. The tournament was a great opportunity to practice negotiations and to learn about the benefits of negotiation support systems. Though I was sceptical about the usfullness of the suggestions and improvements automatically generated by Smartsettle in the beginning, I figured out that these functions facilitate negotiation and improve the negotiated solution considerably. They help you to consider options and trade-offs formerly unconsidered and to be responsive to your opponents needs. At the beginning we had some technical problems with the software but also with understanding the meanings of suggestions, proposals etc. During the negotiation we got used to it. We enjoyed the Smartsettle option for writing comments and discussion. The graphic view was helpful for visualize the stage of the different discussion points. The negotiation ran very fair and always in time. It was a pleasure to deal with our partner. The negotiation tournament has been a great experience. The training, the tournament and Smartsettle gave me a new insight in negotiations. Getting to a mutually satisfying agreement without ever meeting or even talking to one another is definitely one of the strong sides of Smartsettle and shows the potential of ENS. I found the competition to be a tremendous learning experience. I have used other ODR sites and none of them offers the power of Smartsettle. With power goes complexity and the relatively steep learning curve for Smartsettle is well worth the effort. The competition helped my learning process immensely. The eNegotiations competition has given me a chance to experiment with an excellent negotiations tool, Smartsettle. The competition and the Smartsettle tool highlighted that a critical aspect of negotiations is the inter-dependencies between negotiations issues, not just the issues by themselves. The competition has been an entirely enjoyable and stimulating experience. It took a bit of experimenting to understand how to manipulate he formulae initially. Then it became very easy. I like the way the system allows you to analyze the issues according to the clients priorities. The eNegotiation was fun...Smartsettle is a powerful, fast, and efficient tool. Smartsettle is an economic no-brainer for my business; its like having a calculator while others are left counting on their fingers. It was a pleasure participating in the Smartsettle competition at the 2008	International Forum on Online Dispute Resolution. I am presently setting up Clancy Adjusting and Mediating. I believe this technology has an enormous untapped potential in insurance claim negotiations and the civil dispute resolution process. I enjoyed the process and would be very interested to see how the program would work in a real negotiation. I found SmartSettle an enjoyable exercise and a good adjunct to <a href="http://www.odr.info/cyberweek2007/" target="_blank">Cyberweek</a>. Thanks for the opportunity to practice online negotiation. &quot;Practice tests&quot; like these are the first steps to wider implementation &amp; acceptance of e-negotiation, and Smartsettle provides a nice environment to test our skills and work through any questions we might have about the process. I enjoyed the contest and the challenge of trying to figure out what was the best way to try to settle the case given. As part of <a href="http://www.odr.info/cyberweek2007/" target="_blank">Cyberweek</a>, this contest was certainly an important extension of the week long experience. I really enjoyed participating, and I hope to participate again soon. Congratulations for your program. The competition was fun and a good opportunity to learn how to use the system. The students in the Mediation Clinic at the Frank Evans Center for Conflict Resolution (South Texas College of Law) had their eyes opened. Thanks. I have been a fan of Smartsettle for years. It is too bad I was too busy with other obligations during this tournament to spend much time on the competition. "I am honored to participate in Cyberweek 2011. Smartsettle provided a unique platform with which to practice electronic negotiations. I am very impressed by Smartsettle’s dampened pendulum arbitration, a creative method of arbitration guaranteeing a collaborative outcome. The dampened pendulum arbitration encourages fair concessions. If negotiators have agreed to arbitration in case of no agreement at the end of negotiation, the Smartsettle platform uses an expert neutral’s decision to favor the negotiator whose last offer was closest to fair. During the negotiations at Cyberweek, I was bargaining aggressively, but fair concession was my guideline. I highly recommend the Smartsettle platform. eNegotiation is gaining popularity, not only because it can save time and money, but it can also encourage generosity and fairness. I believe that eNegotiation will be widely used. I will share my great experience with everyone." "It was my pleasure to take part in the eNegotiation competition sponsored by Smartsettle. Smartsettle provided us with the electronic platform to negotiate with many students from various countries. I learned so much from this competition. First, I have built up my confidence. I can do it! During the competition, I tried my best, but I did not believe I could be among top ten! Second, I improved my English not only by reading the rules of competition, original cases and click-wrap agreement in English but also by using English to communicate with my counterparts. Finally, I discovered that to some extent, eNegotiation is more convenient and more efficient than face-to-face negotiation. I am looking forward to participating in Smartsettle Infinity, the advanced eNegotiation system. I would like to thank Dr. Ernest Thiessen, Derek Barber and other Smartsettle team members for a superb job."